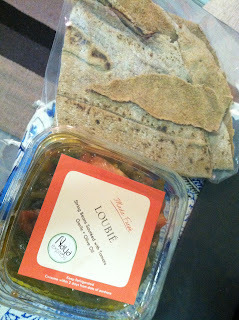 Yesterday hubby got me some Loubie from Naya Mezze and Grill, a Mediterranean affair known for their kabobs. It was like Chinese stir-fry western style, with string beans sautéed with tomatoes then drizzled with olive oil and garlic. It came with servings of pita bread. Unfortunately I didn't have a container when heating this up, so it happened to be a little melted - the plastic box I mean - by the time I took it out the microwave. 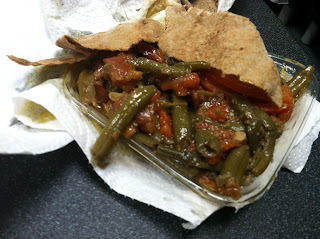 The pita bread too was zapped a little too much, and quickly turned hard afterwards.